At SpearRanch Multimedia, our attentive staff is available Monday through Saturday to answer your questions and ensure you are 100% satisfied. Planning a wedding? Here are some thoughts and observations (below) about wedding planning and execution from an experienced videographer AND a father who has paid for a wedding. I understand both sides of the coin (yes, pun intended). Why Make a Wedding Movie? Wedding pictures are among one of the first things that come to mind when planning a wedding, but having a movie made of the wedding is often further down a couples’ planning list. Some couples aren’t even aware such a product exists and most don’t know how really good they can be. Consider this: there is no single item you can purchase to better preserve your cherished memories than commissioning a videographer to make a movie of your wedding. A collection of photographs can capture visual aspects of an entire event but the wedding story is much better portrayed in a movie. Imagine scripting your wedding where no vows are spoken, the minister or nuptial official remains mute, there are no toasts, or your guests are instructed not to clap or shout. That is how pictures alone record the moment. 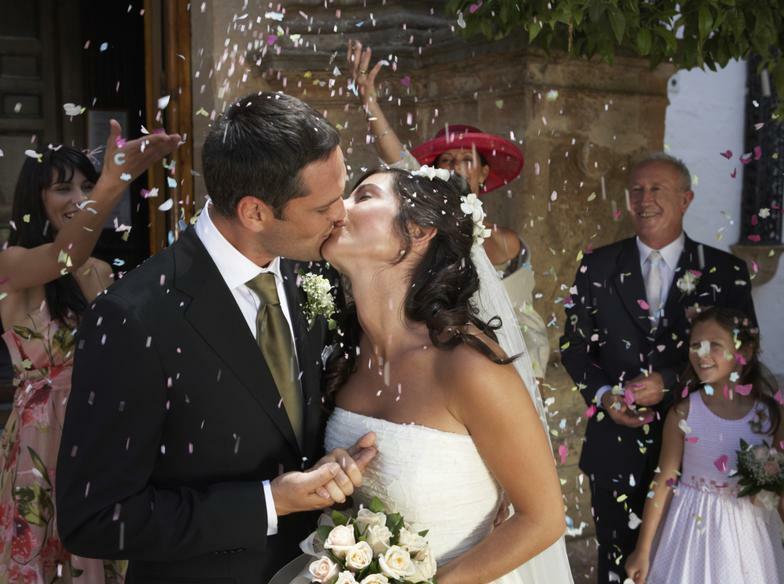 Preserving your wedding memories is greatly enhanced with audio. This is especially true during the ceremony when your vows are recorded but there are also other important moments as well: reception toasts, the music during the first dance, and the cheers of glee as you head toward your “getaway” car. Also, wedding movies enhance memories by showing different aspects of the event that you didn’t see or recall. For example, in the movie the bride gets to see her groom and groomsmen getting ready for the wedding, laughing and talking, or perhaps sharing a pre-wedding drink. 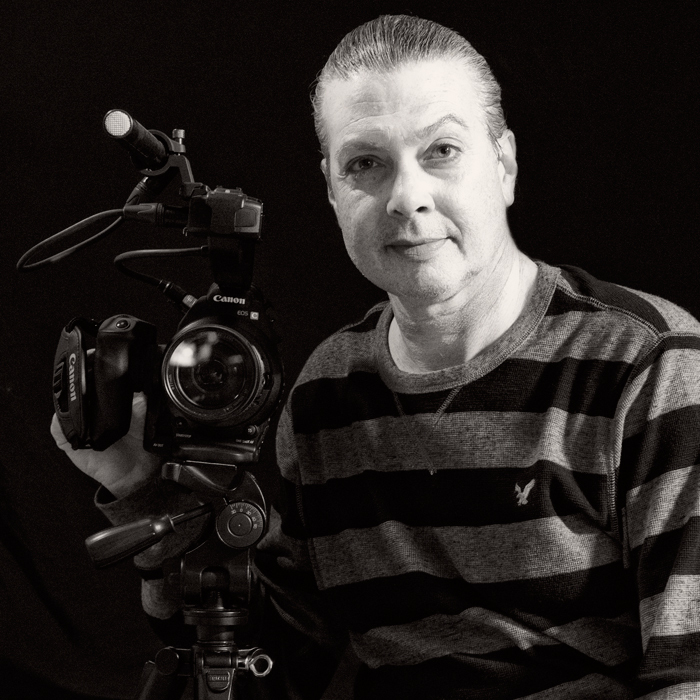 In my experience as a videographer I often get feedback from brides that they didn’t fully remember some of the wedding scenes because “it was all a blur”. That happens a lot! The movie provides another perspective to the bride–how did I look when walking down the aisle to meet my soon-to-be husband? The wedding movie relives all of these special moments, capturing them not only for the first time you see it but also for years to come. You could make watching your wedding movie a part of your anniversary ritual! 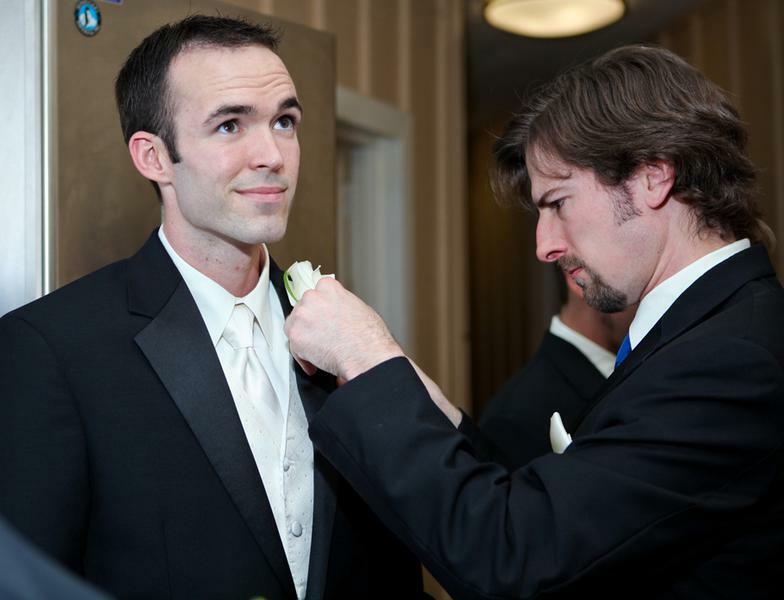 Of course meeting your wedding budget is important, but consider making prudent trade-offs when planning your expenses. Elaborate table centerpieces, over-the-top flowers, or spiffy transportation may look or feel great that day, but they are temporary accoutrements whose utility will be over after the now married couple drives away. I’ve sometimes thought what a waste when seeing parents and helpers throw amazing flower arrangements and centerpieces in the trash as they are cleaning up after weddings. It’s true a few are taken home and enjoyed for a while but a vast majority of the wedding’s money is simply discarded after the wedding. Here is the final reason for making a wedding movie. Just think if you could have watched a movie of your parents getting married. How cool would that be? You can give that gift to your children. How cool that would be! So when planning your wedding think about what will be important to you both years after the big day. Memories from a well-made wedding movie will live on much longer than elaborate flowers! Venue selection is probably the most important consideration of your wedding. Well, okay, maybe selecting your wedding partner is the most important! Anyway, all other aspects of your wedding orbits around your venue. It’s been my experience the reason a particular venue is selected is very personal and almost every couple could give me a specific reason why they chose their venue over all the others they considered. Surprisingly, every answer has not included price! I’m sure price was a major consideration, but that aside, they talked about other reasons for selecting a particular venue. I always ask this question because I want their movie to reflect and incorporate their vision for their venue selection. This helps me determine which venue shots to take. When selecting a venue, the first question to answer is outside or inside? My next two articles will be about the advantages and disadvantages of each. Outside venues can be incredibly beautiful and picturesque but they come with a major weather concern. Be sure you have a solid and feasible “Plan B” if you choose an outside ceremony! Once I shot a ceremony that was planned to be outside under beautiful oak trees and a gazebo. Wedding day arrived, and I had all my (multiple) cameras set up and ready to go. All of the cameras were placed with meticulous care and had a specific mission based on who was doing what, when, and where during the ceremony. There was a small threat of rain that day but so far it hadn’t rained. Then the bride’s worst scenario occurred as it started raining 15 minutes before the ceremony was scheduled to start! Already seated guests scrambled for cover as the couple decided what to do. Of course, all of this frantic communication was delivered via courier since the couple had a ‘do not see’ policy in place. It was decided the wedding would be moved to an adjacent pavilion. Earlier, this ‘Plan B’ sounded good in theory when considering the venue; however, ‘Plan B’’s practicality was clouded by the vision of the ‘perfect’ wedding under those oak trees. The event staff hurriedly moved guest chairs under the pavilion as I transported my cameras competing for the same space. I placed them in multiple, unrehearsed locations hoping I could still record the perfect wedding ceremony. Then another bump in the road occurred and I had to move the cameras as the event staff placed chairs further encroaching into the line of sight designated for the happy couple and wedding party. There was simply not enough room to accommodate all the guests’ chairs and have enough distance between the couple and my cameras. The geometric angles that I had so carefully planned around the oak trees were now hurriedly replaced by acute angles that did ‘the best they could’ to capture the ceremony action. Then there was another complexity – the backlighting was horrible. The couple’s nuptial location was now on an edge of the pavilion that opened into the outside light. Even though it was cloudy during the rain, there was enough lighting contrast between the pavilion’s very dark shade to the outside backlight that made the camera’s exposure level go nuts. Furthermore, one of the secondary cameras was set in the aisle that was so narrow one of the groomsmen moved it while seating a guest which changed the framing (its intended shot) of this camera. The ceremony had already begun so there was no chance for reconciliation. But the worst situation was there was not enough room to set up the primary camera with a perpendicular line of sight to the couple to get the best footage. So many things were going wrong! Thankfully, the rain stopped at the very beginning of the ceremony so I moved my primary camera out from under the pavilion and almost perfectly perpendicular to them albeit with the pastor’s back to the camera. The wedding couple’s primary shots were outstanding because what was once nemesis backlight was now well diffused light shining on my subjects. 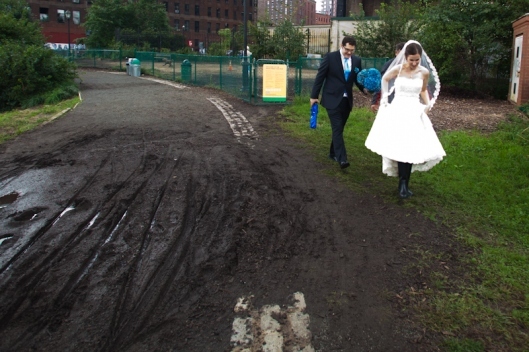 I was so fortunate that the rain subsided and the ceremony footage could be salvaged. For an outside wedding venue, if the threat of rain isn’t bad enough, there is another peril to consider: the wind. Brides usually think about the wind and plan accordingly by choosing an appropriate veil and using enough extra-hold hair spray in order to to survive a gale. But wedding couples rarely consider the wind’s impacts on the movie’s audio. A clear indicator of home-made video is wind noise in the audio from a camcorder’s built in microphone. Professionals always use higher quality external microphones attached to their cameras which can be protected from wind noise. In the video business, one of these wind protection devices is called a ‘fuzzy caterpillar,’ and it slides over the microphone and eliminates wind noise up to about 25 mph. Another device is the ‘full zeppelin’ which totally envelopes the microphone and can muffle wind noise well in excess of 25 mph. Both of these devices work very well on my 20 inch shotgun microphones typically used on professional cameras or audio technicians holding a microphone at the end of a boom; however, those are not the microphones typically used to capture wedding ceremony audio! Instead, the best configuration is a lapel microphone, usually with a wireless connection to my camera. Lapel microphones are very small, which makes them easy to situate for close sounding audio. However, the conveniently portable small size also means they have very little area to allow for wind protection. I have ‘fuzzy caterpillars’ for my lapel microphones but wind over 15 mph can still be detected. However, is still much better than a built in camera microphone. The final consideration from a media perspective regarding outside ceremonies is direct sun. Direct sun casts harsh shadows which can mask the side of a face in an unflattering manner or overexpose the side facing the sun. Then there is the possibility that the bride, groom, or wedding party is squinting. Mole eyes do not make good pictures. Always choose an outside location that is protected from direct sunlight for all the wedding party and preferably the audience too. Guests can get too hot in direct sunlight depending on the time of day. It’s best to pre-visit and evaluate your outside location on a sunny day when the sun will be positioned in the sky about the same time of your wedding. Choose your pre-visit time relative to sundown rather than the absolute time of your wedding. If your ceremony is 2 hours before sundown on the day of your wedding, then perform your pre-visit 2 hours before sundown. The sun’s position will be very different at 4:00 PM on your pre-visit day in the winter than 4:00 PM of your wedding in the spring. Don’t think that inside venues are immune to weather considerations. Choose a venue that allows the car to drop you off in a weather protected environment – even against blowing rain or snow. Large overhangs allowing cars to drive through work well; even better are underground (basement) entrances. This is especially true if the ceremony is held at a different location than the reception since the last thing the bride wants is wet hair and dress. Weather protected entrances also greatly assist your vendors as they have a lot of equipment, food, flowers, etc. to unload. Light inside the ceremony location is a major consideration because quality video requires much light. Some sanctuaries are naturally dark because of the lack of strategically placed windows and depend upon ceiling mounted lights for almost all of their illumination. Ensure your venue is well illuminated. Often the spot where couples exchange their vows are well lighted but sometimes the audience’s seats can be dim. This is especially true when balconies overhang a portion of the audience’s seats or cover some of the aisle leading from the back of the church. It’s been my experience there is never enough light under balcony areas.. Usually moving subjects are well illuminated when they walk directly under the ceiling’s spot light but become dark again once they move away from the lighted spot. Recording a bride walking down the entire aisle under this circumstance is almost impossible, leaving it up to the editing process to not include footage when the bride (and everyone else in the wedding party) is in dark areas. The final, but very important, consideration in choosing inside venues is any possible facility restrictions of media coverage. Some venues have meticulous restrictions where photographers and videographers can be located during the ceremony and even in the manner that audio can be recorded. Churches and chapels are the most restrictive and some churches’ religious affiliations are more restrictive than others. The worst situation I’ve encountered was being told I had to be in a location where I couldn’t be seen by the priest. He didn’t want to be distracted. Through some compromise, my concluding spot placed me at least 600 feet from the back of the church from the couple’s nuptial spot. Being clever and undaunted, I placed smaller, unattended cameras closer to the front of the church that were controlled remotely to still obtain close up video. I thought I was safe since the priest could only see a couple of small cameras rather than me. But once they were discovered by church staff, I was told I couldn’t put those cameras there either! It’s a good thing my primary camera has an amazingly good zoom lens because I was still able to pull it off and make a great ceremony movie. But there was another challenge. That same church would not let me put my wireless microphone on the priest. This meant that the only audio I could record was from the facility public address system which was hammered with acoustical distortion as the sound bounced around the voluminous chapel. Bottom line, this particular church just didn’t want the ceremony to be recorded and was putting any restriction, and changing the restrictions as I would develop alternative solutions, to make it as difficult as possible. The point here is to ask if your venue has any type of media coverage restrictions during the planning stage and consider how those may affect the lasting products (photographs and movies) of your wedding day. 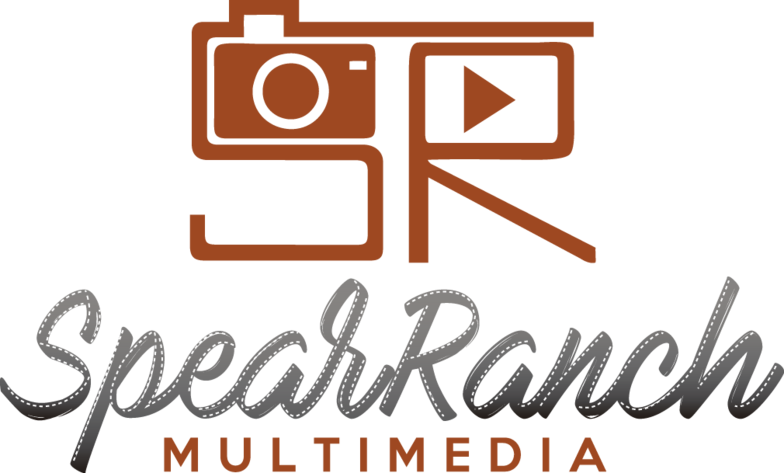 SpearRanchMultimedia is a showcased Weatherford, TX videographer on Videographies.com!